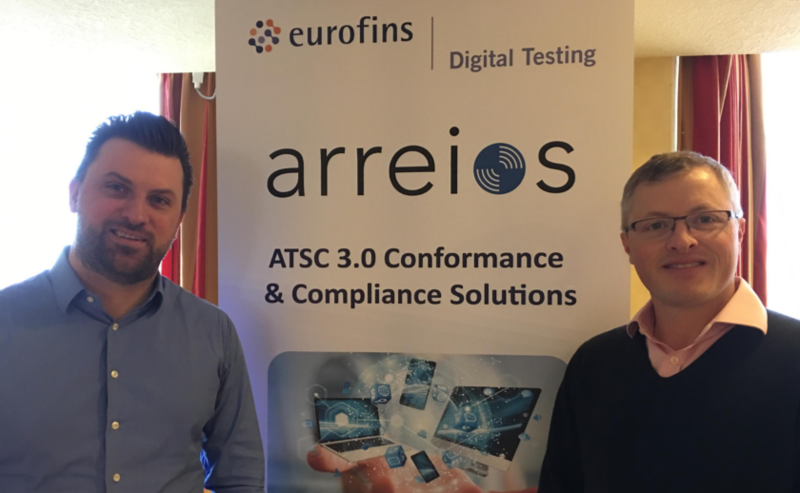 LAS VEGAS — Eurofins saw strong interest for its new Arreios for ATSC 3.0 suite of test automation tools at NAB this past week, according to Tim Morgan, managing director, U.K., for Eurofins Digital Testing. The company had been working on the tools for a while, along with its new Arreios Test Harness that it said will enable automated validation of the complete implementation of a receiver, including broadband and broadcast components, to verify interoperability and conformance. There was a clear need for the Test Harness, along with “a basic set of test material to enable device manufacturers to start implementing” the new ATSC standard this year so that TVs supporting ATSC 3.0 can be launched in 2020, Morgan explained to the Media & Entertainment Services Alliance (MESA) in an interview at NAB. As Eurofins announced just ahead of NAB, its new test suit enables the certification and testing for ATSC 3.0 features including Ultra High Definition (UHD) and High Dynamic Range (HDR) video over broadcast and broadband, interactive applications, targeted advertising, emergency alerts, content recovery and watermarking. The Arreios for ATSC 3.0 Conformance Test Suite includes a complete lab test environment for device black box testing, as well as: Built-in automation and an intuitive user interface (UI) for managing test execution; an ATSC 3.0 test plan and test information (test assertion, procedure and specification references); video capture and automated video playback recognition; an audio/video data processing unit for verifying A/V synchronization and frame rate detection; dynamic stream packaging and playout; an integrated web server for hybrid scenarios, including applications and broadband video use cases; and integrated test report generation for quality assurance (QA) teams and conformance/certification use. Eurofins this year also once again spotlighted its test automation product that’s focused on giving broadcasters and providers of applications and services to broadcasters “a means and way of automating testing of their applications or value-added services and devices,” Morgan said. That visual test automation product “has a good strong list of customers” so far, he noted. But “we’ve taken it a step further this year, and enabled the capability to test smart TVs” using just a camera and some artificial intelligence (AI) “to depict what’s happening on the TV and screen… and that is a quite new and significant step compared to what we showed last year,” he said. Eurofins exhibited at the Futures Park section of the NAB show floor this time, where it was one of several companies and organizations touting ATSC 3.0 innovations, he said, noting his company saw steady traffic all week. Eurofins also used NAB to tout its cybersecurity testing services, which is an expanding business for the company, Robby Putzeys, its international marketing and sales director, pointed out. The company is, for example, focused on the growing need for General Data Protection Regulation (GDPR) product device testing, he said. 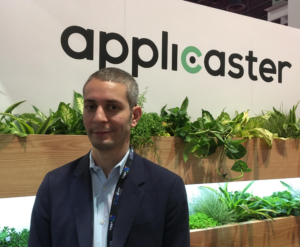 At NAB, Applicaster focused on its Software-as-a-Service (SaaS)-based app platform Zapp, which Jonathan Laor, its CEO, told MESA is “a huge step towards an open” application program interface (API) environment for developers to create media applications. After all, an increasing number of customers have development teams and “have original IP that they want to bring to life,” he said. But “a platform traditionally takes away from the level of control development teams can have,” he noted. What Applicaster wanted to do, however, was “allow developers to use it as a development tool, as a development environment,” and also enable Applicaster’s partner ecosystem, so customers “can enjoy a richness of choice when they seek to add new business capabilities,” he said. During the show, Applicaster also highlighted the depth of its partner ecosystem and had representation from Cleeng, Comcast and other ecosystem members at its booth. 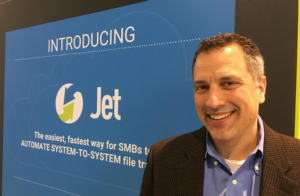 “What we’ve done with Jet is sort of taken” the company’s “expertise in automated file transfer, combined with our expertise in cloud native Saas, and we’ve launched a product that brings those capabilities down market, such that now any size business can build out automated workflows using a very simple SaaS interface connected to their storage locations,” Jon Finegold, chief marketing officer, told MESA at the show. As an example of how Jet can benefit an organization, he pointed to one Signiant customer that’s a digital cinema distribution company in Malaysia. Prior to Jet, that company was “literally truck-rolling hard drives across the country” and was “even using armored vehicles for security purposes to deliver” Digital Cinema Packages (DCPs) out to cinemas, he said. But, with Jet, when that company licenses a new film, it now just has to “drop it in a folder” and it “automatically disseminates to all 170 theaters,” he said. Targeted at simple “lights-out” use cases, Signiant Jet meets the growing need to replace scripted File Transfer Protocol (FTP) with a faster, more reliable and more secure alternative, the company said ahead of NAB. Also at NAB, Signiant and Cloudfirst.io, an innovator in next-generation digital archive transformation, announced a new partnership that integrates Cloudfirst.io’s Rapid Migrate legacy archive migration solution with Signiant’s patented acceleration technology and SaaS platform. ZOO Digital used NAB to tout the launch of its ZOOstudio ecosystem, a service ecosystem that aims to simplify localization for content owners, increase vendor collaboration and reduce supply chain wastage. “When we talked to customers, one of the things that we recognized from them” was that they’re using multiple vendors and “they’re all building their own systems, but that doesn’t make our customer’s life any easier,” Gordan Doran, its president, told MESA at the show. “The idea behind ZOOstudio was that we could actually deploy a front end for our customers” that would allow them to “interact with other vendors, not just us,” he explained, noting “we built this from scratch.” Initial feedback to ZOOstudio was “positive,” so ZOO was “really encouraged,” he told us. Designed to address the challenges of OTT distribution, the company announced ahead of the show that ZOOstudio provides content owners with a centralized system for ordering, tracking and managing all the services required to create localized content packages. ZOO’s collaborative approach sees services such as dubbing, subtitling, metadata localization and media processing delivered either by ZOO as the end-to-end vendor or in combination with clients’ other preferred global vendors. 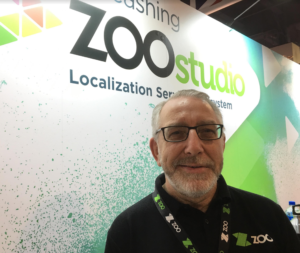 ZOO Digital is also expanding its cloud dubbing services through a global network of ZOO-enabled dubbing studios (ZEDS), with more than 50 in-territory ZEDS having joined the vendor’s cloud dubbing services network, the company said. It also unveiled cloud-dubbing innovations for faster time to market, including lip sync dubbing, casting and audio creation.